EBIT can be calculated in two ways: as net income plus taxes plus interest, and as revenue minus operating expenses. 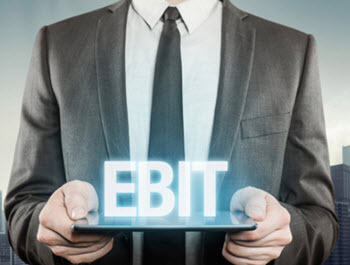 EBIT might also be referred to by using a few other terms. These include ‘Operating Profit’, ‘Operating Earnings’ and ‘Profit Before Interest and Taxes’, shortened to PBIT. Now let us take a look at what EBIT is in a little more detail. The figure, by removing interest expenses and taxes, shows purely a company’s ability to create earnings from its operations. With this neat little metric, EBIT can be very useful under a number of different circumstances. For example, an investor looking to buy out a company will find need to understand that company’s EBIT. It also removes the complications that can arise through companies having different taxes and financing strategies – the EBIT metric makes it easier to compare companies working in the same industry, allowing for a simple judgement of profitability. Since EBIT is not a GAAP metric (i.e. it does not fall under ‘generally accepted accounting principles), the EBIT calculation is not usually reported in a company’s financial statements. There are various ways to calculate a company’s EBIT, but in all cases, you should start with the total revenue (total sales) and from this deduct operating expenses. Operating expenses should also include the costs of goods that have been sold. At this point you may want to remove extraordinary or one-time expenses, such as the cost of a lawsuit or the revenue generated from the sale of asset owned by the company. These expenses can be included if you wish, but because they do not pertain to the company’s core operations they may be excluded. Likewise, revenue generated from non-operations, such as income from investments, can be included or excluded. Another element that can be included or excluded from the EBIT calculation is interest income. Some businesses extend credit to their customers as part of their integral operations, making it a key component of their operating income. However, this may be excluded when interest income comes from, for example, late fees charged to customers, or interest that is earned on a bond investment. Looked at in its most simple terms, the EBIT calculation takes the net income figure, found on the income statement of the company being compared, which is then added to the interest expense and income tax expense. Looking at this from another way, the EBIT is calculated through subtracting the operating expenses from the total revenue. There are limitations when using the EBIT metric, such as when the companies to compare are of very different sizes, for example; in this case it would be more useful to use a financial metric that results in a percentage figure, rather than the pound or dollar result of the EBIT calculation.